Prior to CES 2018, the Las Vegas Convention Center gave NanoLumens 30 days to install two back-to-back 40-foot LED displays. Seriously. And it went well! On the bright side, only 170,000-plus onlookers would have noticed if the two back-to-back 40-foot LED displays that NanoLumens had 30 days to install prior to CES 2018 didn’t work out so well. Luckily, that didn’t happen. Instead, the giant NanoLumens video walls were among the stars of Consumer Electronics Show 2018 at the Las Vegas Convention Center (LVCC). LVCC in conjunction with Cox Business and Hospitality Network wanted to transform itsdigital infrastructure with the integration of NanoLumens’ AWARE display management platform for system monitoring and content distribution for more than 15 LED and LCD displays dispersed throughout nine locations, according to a NanoLumens press release. 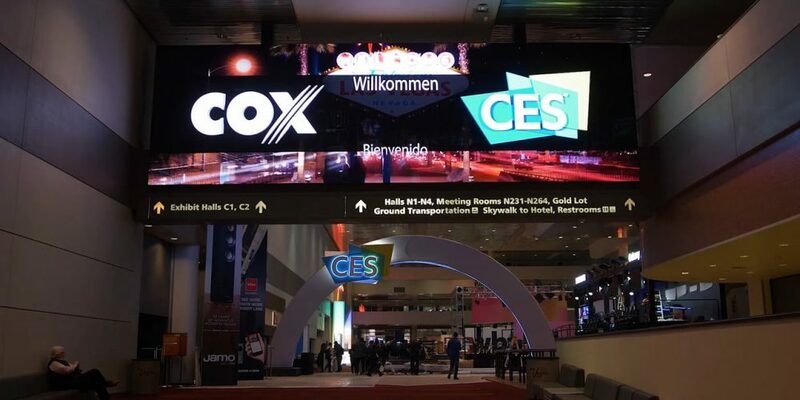 Prior to CES 2018 LVCC worked with Cox Business and Hospitality Network to install back-to-back 40-foot LED displays over a main visitor walkway. “These huge overhead displays demand attendees’ attention and provide exhibitors and show organizers an unforgettable means to advertise and share information, while our innovative AWARE platform seamlessly integrates them into the same content and monitoring system currently managing the 15 displays that are located throughout the convention center,” Merlino says. “The expansion capabilities of AWARE will allow LVCC to add and then control and monitor unlimited LCD and NanoLumens LED displays, guaranteeing smooth performance, industry leadership and adaptability to new trends for years to come. Even though the plans for this large project were finalized just a month before CES 2018, installation was completed five days ahead of schedule, allowing LVCC to test and ensure perfect operation before the consumer electronics show. The new NanoLumens displays were custom designed and built to fit and maximize use of the available space, utilizing a 4mm pixel pitch design, offering 1700 nits of brightness, and weighing less than 3,220 pounds, which isn’t possible with paneled LCD videowalls. The convention center’s NanoLumens’ AWARE network is currently the largest in the world, running more than 15 displays in nine locations, including the two 40-foot LED displays, five single LCD displays, four 4×1 LCD videowalls, four 5×2 LCD videowalls, and one 6×6 LCD videowall. According to Jady West, Hospitality Network senior director of sales, the NanoLumens LED displays were chosen to provide an ultra-modern, seamless digital display, in contrast to paneled videowalls with bezels. Additionally, the AWAREplatform will allow Cox Business and Hospitality Network to scale up for future installations and even provide a simplified means of managing multiple locations if required.